Increasing attendance at the Chicago Botanic Garden and sister institutions around the country supports my conviction that public gardens are more relevant than ever to peoples’ lives. Our living museums are uniquely positioned to meet the pressing challenges of our time—climate change, a need for improved physical and mental health, workforce training, stress, and more. The Garden’s mission statement says it best: We cultivate the power of plants to sustain and enrich life. As we work to fulfill our mission, we attract more and more visitors: In 2014 we welcomed 1,058,368 visitors, a 6 percent increase over our record-breaking 2013, and 52 percent more than in 2005. 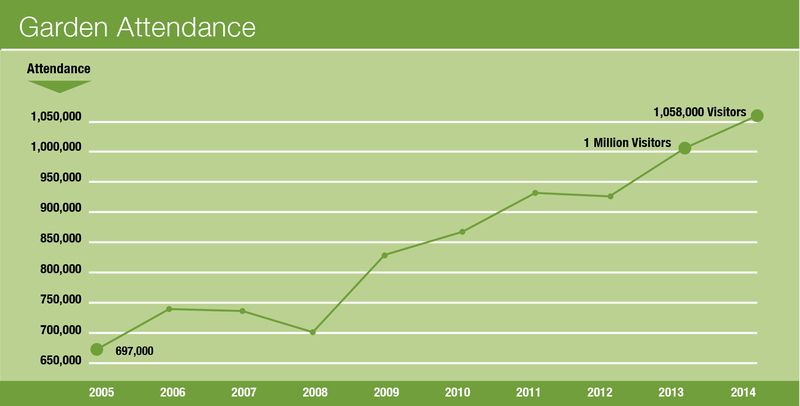 These numbers tell us that something very significant is happening at the Garden. Our mission compels us to provide meaningful and joyful experiences that speak to the essential role plants play in all of our lives. We continuously work to improve the relevance of that experience and in 2014 enhanced our already-rich menu of programs and services. February saw the launch of the Garden’s first month-long orchid exhibition, a stunning celebration of the world’s largest flowering plant family. The Orchid Show filled the Regenstein Center with fragrance and color, attracting 25,000 visitors seeking respite from the Chicago winter. 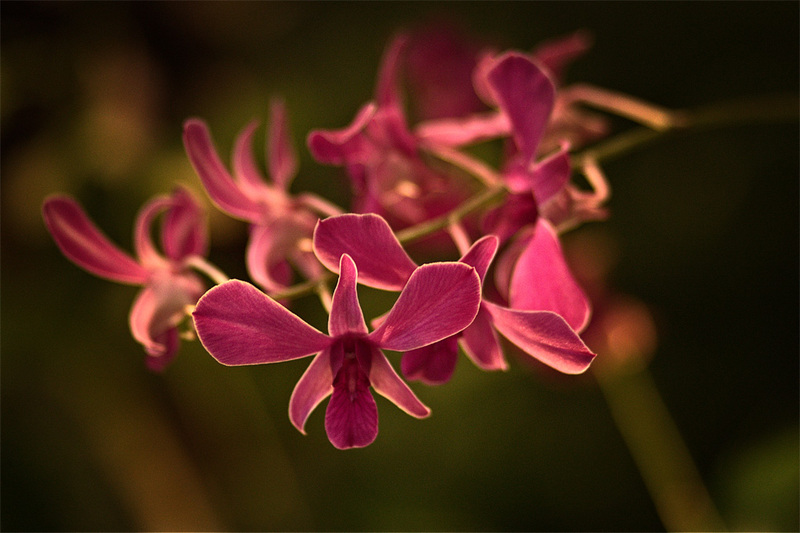 The beauty of the tropical blooms inspired awe, and also helped visitors understand the value of plant diversity and the importance of conserving the natural habitats on which all life depends. A newly refurbished Garden View Café opened in spring. The updated menu features the best in local and seasonal food—some of it grown through the Garden’s Windy City Harvest urban agriculture program. We’ve added a brick pizza oven and barista station, and now serve brunch all day on Sundays. Our Sprouts Meals put a healthy twist on traditional children’s favorites. The café serves up delicious, fresh meals, and also serves as a model for sustainability. 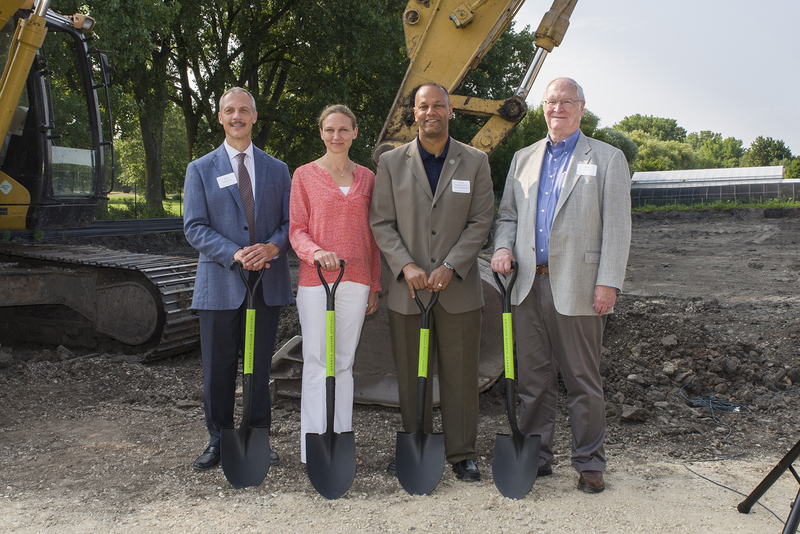 In summer, the Garden broke ground for a new 151,000-square-foot outdoor nursery, the first phase of construction for the Kris Jarantoski Campus. The campus will include a new plant production facility and display garden designed by Belgian landscape architect Peter Wirtz. The facility will ensure horticultural excellence, support advanced conservation research, and expand the plant-based educational programs at the Garden. Wirtz’s innovative landscape design will unify the south end of the campus and draw visitors to a lesser-known corner of the Garden. 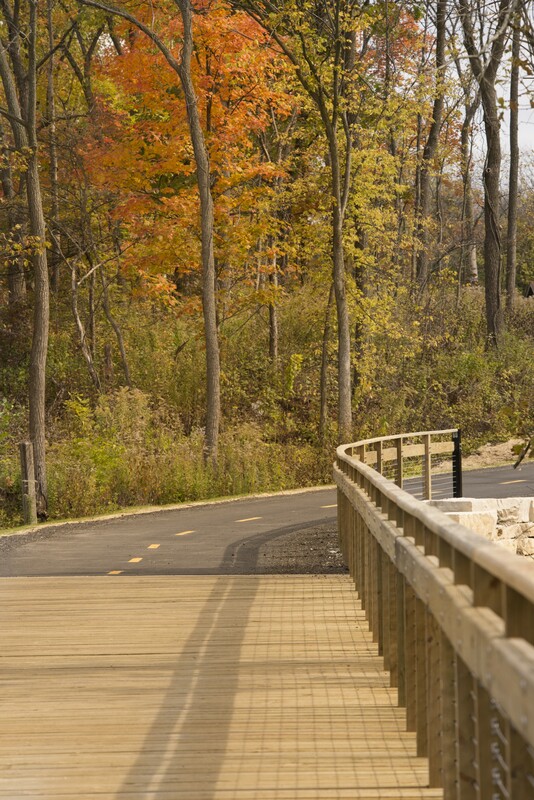 The North Branch Trail addition opened in early fall and makes the Garden more accessible to the roughly 80,000 to 90,000 visitors who enter by bike or foot each year. The multiuse path provides a safe, scenic route from the Braeside Metra Station in Highland Park to the Garden, and connects the North Branch Trail with the Green Bay Trail. The North Branch Trail addition opened this past fall. The Garden’s expanding influence extends well beyond our Glencoe campus. In December we celebrated 20 years of helping Chicago Public Schools students succeed in science, technology, engineering, and math (STEM). In addition to the over 30,000 students who participate annually in the Garden’s formal education programs, to date, approximately 500 students have taken part in the Garden’s Science Career Continuum programs. Nearly all participants tracked since 2006 have enrolled in college; of these, more than three-fourths majored in a STEM field, and nearly two-thirds pursued science. 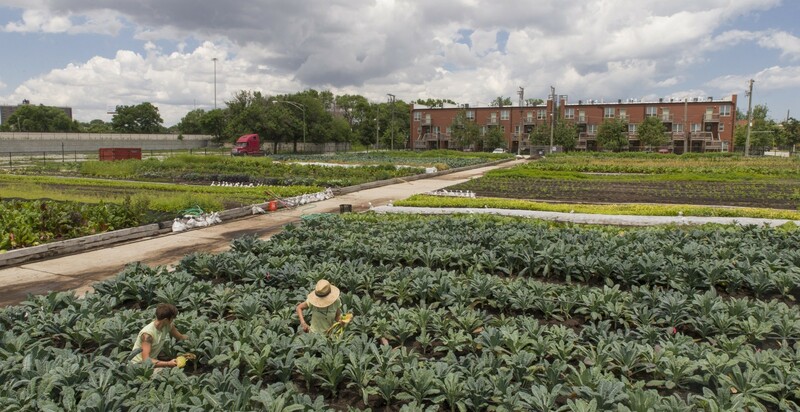 A USDA NIFA (National Institute for Food and Agriculture) grant is enabling the Garden’s Windy City Harvest urban agriculture programs to mentor urban farmers in Chicago. Three years into the grant, we’ve created four incubator farms as part of the redevelopment of the former Robert Taylor Homes public housing project. Other Windy City Harvest components include a teen leadership training program and a series of professional certificates offered through the Arturo Velasquez Institute, a satellite of Richard J. Daley College, City Colleges of Chicago. In December, the White House announced the Chicago Botanic Garden’s C3I initiative as part of a sweeping new approach to climate-change education. C3I (Connecting Climate to Communities Initiative) unites 12 Midwest community organizations in an effort to engage populations underrepresented in the environmental movement. Our scientists travel the globe, collaborating with peers worldwide to monitor, conserve, and restore critical habitats, research underutilized food crops, and mitigate the effects of climate change. The Daniel F. and Ada L. Rice Plant Conservation Science Center opened five years ago and so far has graduated 50 master’s degree students from our plant biology and conservation science program, offered in conjunction with Northwestern University. We are looking forward to seeing the first Ph.D. candidates graduate this spring. Look for continued growth in 2015 as the Garden continues to progress toward goals set out in its ten-year strategic plan, “Keep Growing” (2010–20). What keeps us going? We believe beautiful gardens and natural environments are fundamentally important to the mental and physical well-being of all people. We believe people live better, healthier lives when they can create, care for, and enjoy gardens. We believe the future of life on Earth depends on how well we understand, value, and protect plants, other wildlife, and the natural habitats that sustain our world. Please join us in our mission.